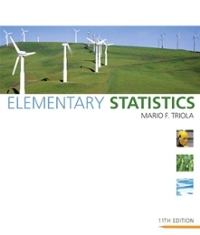 Elementary Statistics 11 Edition Mario Triola’s Elementary Statistics remains the market-leading introductory statistics textbook because it engages students with an abundance of real data in the examples, applications, and exercises. Statistics is all around us in our daily lives, and Triola is dedicated to finding new real-world examples and data sets for you to use in your classroom. The Eleventh Edition contains more than 2000 exercises, 87% of which are new, and 82% of which use real data. It also contains hundreds of examples, 86% of which are new and 94% of which use real data. By analyzing real data, students are able to connect abstract concepts to the world at large. As a result, they gain conceptual understanding and learn to think statistically, using the same methods that professional statisticians employ. This text comes packaged with a CD-ROM that includes data sets in various formats and other resources. Data sets and other resources for this book are also available at our website.